To see ratings, reviews, traveler tips, and tourist information, read our Djerba Island trip planning app . Riyadh, Saudi Arabia to Djerba Island is an approximately 11-hour flight. You can also do a combination of flight and car; or drive. Due to the time zone difference, you'll gain 2 hours traveling from Riyadh to Djerba Island. In April, Djerba Island is little chillier than Riyadh - with highs of 28°C and lows of 17°C. You'll set off for Tunis on the 14th (Sun). Satisfy your inner culture vulture at Bardo Museum and Medina of Tunis. Explore the numerous day-trip ideas around Tunis: Dougga (in Beja Governorate), Uthina (Oudhna) (in Ben Arous) and Ichkeul National Park (in Bizerte). And it doesn't end there: take in the spiritual surroundings of Zitouna Mosque, explore the different monuments and memorials at North Africa American Cemetery and Memorial, don't miss a visit to Centro storico, and explore the ancient world of Ancient Roman Baths. To see photos, traveler tips, where to stay, and tourist information, refer to the Tunis tour itinerary planning site . Getting from Djerba Island to Tunis by flight takes about 2 hours. Other options: drive; or do a combination of taxi and train. Traveling from Djerba Island in April, you can expect nighttime temperatures to be slightly colder in Tunis, with lows of 14°C. Cap off your sightseeing on the 20th (Sat) early enough to go by car to Sousse. Start off your visit on the 21st (Sun): take an in-depth tour of Sousse Archaeological Museum, steep yourself in history at Bourghiba Mausoleum, and then tee off at El Kantaoui Golf Course. To see ratings, traveler tips, reviews, and more tourist information, use the Sousse trip planner . You can drive from Tunis to Sousse in 2 hours. Alternatively, you can take a train; or take a bus. In April, daytime highs in Sousse are 26°C, while nighttime lows are 17°C. Cap off your sightseeing on the 21st (Sun) early enough to go by car to Hammamet. On the 22nd (Mon), enjoy the sand and surf at Hammamet Beach, then wander the streets of Yasmin Hammamet, and then don't miss a visit to Medina of Hammamet. On the 23rd (Tue), you'll have a packed day of sightseeing: examine the collection at D'Enfidha, play a few rounds at Citrus Golf Course, then look for gifts at La Deffirence, and finally pause for some serene contemplation at Eglise du Bienheureux Antoine Neyrot d'Hammamet. To find photos, where to stay, more things to do, and more tourist information, you can read our Hammamet itinerary builder website . You can drive from Sousse to Hammamet in 1.5 hours. Alternatively, you can take a train; or take a bus. 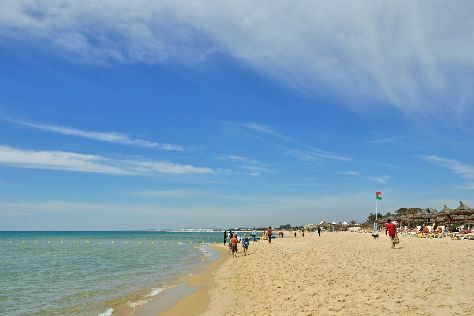 In April, daytime highs in Hammamet are 27°C, while nighttime lows are 14°C. You will have some time to spend on the 24th (Wed) before leaving for home.